The beauty queen shares the story after making history as Madame Tussauds’ first Filipino wax figure. 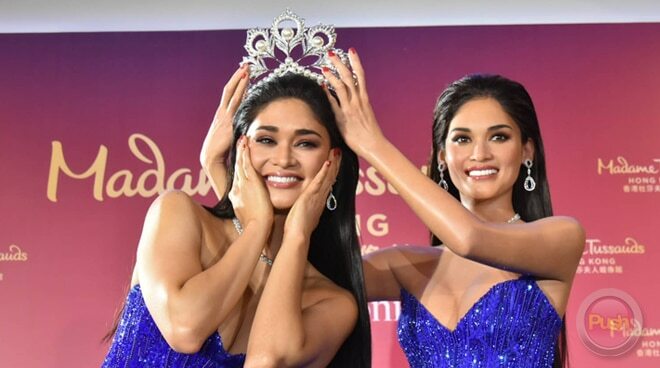 After finding out last year that she was going to be the first Filipino to have her likeness made into a wax figure at the Madame Tussauds’ wax museum in Hong Kong, Pia Wurtzbach admitted that she has been excited to see the finished product this year. "Naiiyak ako kasi parang winning moment ulit, di ba? Sobrang happy at sobrang grateful ako. Never in my wildest dreams did I ever think I would have my own wax figure. I'm nervous. I'm excited. I'm at a loss for words. I just can't wait for you guys to see it in person finally. I'm so happy. I'm so excited. Finally, it looks so real and I can't wait for everyone to see it in person. Mas ma-appreciate mo kasi siya pag nakita mo siya sa personal talaga at lalo na ng malapitan," she shared during her press conference with Madame Tussauds Hong Kong held last March 28. Pia admitted that she received the best birthday gift last September when she found out her wax figure was finalized. "Sobrang gandang birthday gift nito. We finalized na ako yung magiging first Filipino wax figure during my birthday last year. So that was a really nice birthday gift and ayun sobrang from then on sobrang excited ko na. Ini-imagine ko anong pose yung gagawin, ano kayang susuotin na gown. I said yes right away without batting an eyelash. I didn't even think about it. I was so excited. Because I'm a fan. I go to Madame Tussauds. I know how fun it is and right away I said yes," she recalled. Aside from being the first Pinay wax figure, Pia will also be the first beauty queen to be featured inside Madame Tussauds Hong Kong. "Nakakatuwa kasi parang it's a nice moment not just with the Filipinos but also with my family na everybody's just really happy. I hope na marami pang mga Filipinos na makakita nito. Sa mga nagbabalak na magbakasyon soon, why not fly to Hong Kong at dumaan na rin kayo sa Madame Tussauds at ma-crown na kayo na Miss Universe," she shared. Pia's wax figure will be available for public viewing at The Travel Festival at the SM Megamall Fashion Hall starting March 29.